When I married into a Serbian Orthodox family, I gained a Krsna Slava in the bargain, and now I wish everyone had one! You see, many years ago (perhaps a thousand years! ), my husband’s ancestors converted to Christianity; that first household or tribe was baptized on the feast day of St. Luke the Evangelist. Rather than assign a patron saint to each member individually, ever since that first baptism, our family has benefitted from the prayers of one common patron saint, and we have celebrated his feast every year with a beautiful prayer service and meal. 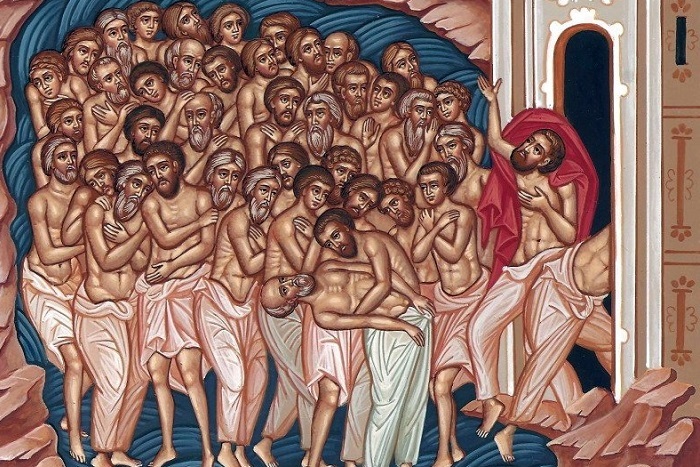 As a convert to Orthodoxy, I have come to love this tradition, and to wish that it would catch on here in America, where so many of us are converting, and establishing our families as new lines of cradle Orthodox Christians. We celebrate Slava on St. Luke’s day every October, inviting family, friends and at least one priest to our home. We bake the traditional kolach (bread) and we make zhito (which is essentially koliva, but because at the Slava it’s offered without memorial prayers, it’s simply blessed wheat). We put out an icon of St. Luke and a nice new candle and some wine, and a prayer list of our family members — both the living and those who have died in the hope of the resurrection. The preparations themselves are beautiful, as the family bakes traditional foods together. When the Krsna Slava begins, we gather together — family and friends — around our icon corner. Father celebrates the beautiful service, during which we’ll pray for St. Luke’s continued intercessions and sing his hymns. During the service, Father cuts a cross into the bread and pours wine along the lines of that holy cross. He’ll hold out the bread and the whole family will reach out to turn it with with our fingertips. That’s my favorite part — seeing the pudgy baby hands next to the old, wrinkled hands, a family gathered together each year to turn the bread and to pray together. 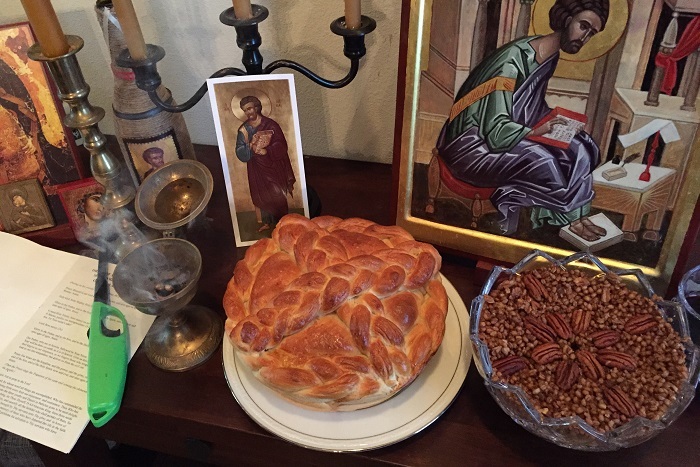 The Slava is so beautiful — from baking with the kids and getting the house ready, to gathering our beloved friends and family, to praying together these ancient and beautiful prayers, and sharing a meal in an atmosphere where God’s love and His blessings are just so palpable and present! Truly, Christ is in our midst at the Krsna Slava, and we count ourselves lucky to celebrate together every year. It’s a tradition that is unique to the Serbs; no other Orthodox tradition has a shared family feast like this. Other Orthodox have namedays; each member has their own patron saint. As the mother of a large family, I’m relieved that we celebrate together rather than honoring multiple name days — especially since in the American culture, we also have birthdays to celebrate! With seven of us in the house, that’s 14 celebrations plus the major religious and cultural feasts that come up throughout the year… Instead, we celebrate one Krsna Slava for the whole family, and we are able to give it the time and attention it deserves. The Slava is the feast day for what St. John Chrysostom calls the Little Church. 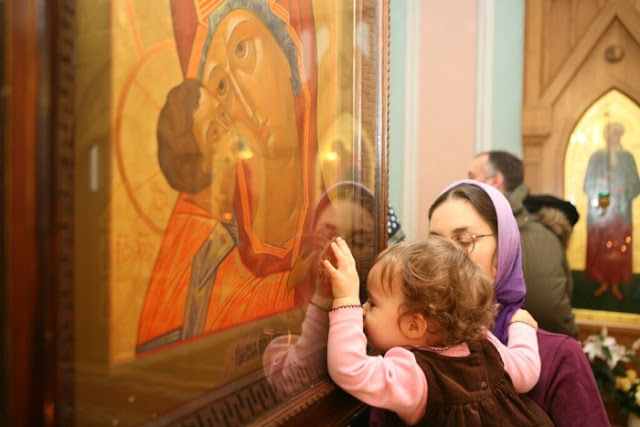 We know that the larger Holy Orthodox Church is organized by Patriarchs and then Bishops, and then divided into priests who lead parishes; and the smallest unit of the Holy Church is not the parish church, but the family. The parents must lead the home like the priest leads the parish, for it is truly in the home that we live out our faith. 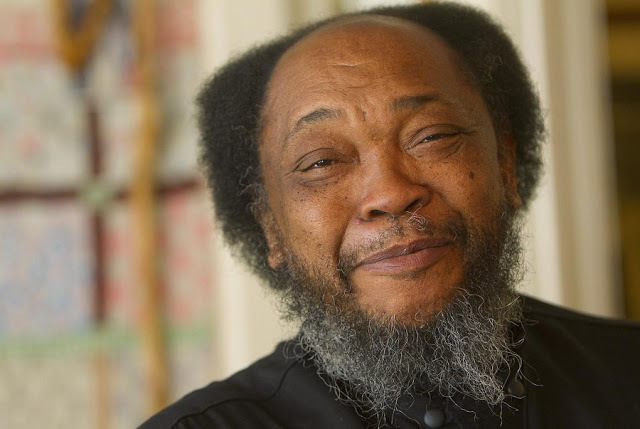 We can attend church on Sundays, but living out the everyday prayer and the fasting and the almsgiving, developing an Orthodox heart — these things happen every moment of every day, and they happen at home. So just as each of our regular churches are dedicated to one saint who is celebrated as the protector of that church, it makes perfect sense that the Little Church might also be dedicated to a particular saint who watches over that family and intercedes on their behalf. Serbian families have passed down the protection and dedication to that saint from generation to generation; the same St. Luke who watched over my husband’s great-great-grandparents will also intercede for us! 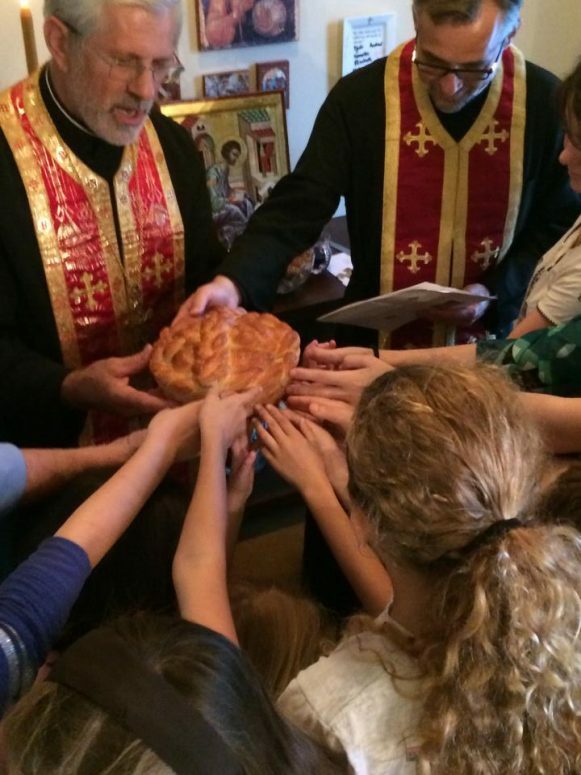 I think my favorite thing about the Slava is the way that we mark and celebrate those first baptisms in the family. We thank God that our ancestors found the Church and held tight to its traditions, so that we could be the inheritors of salvation! Whether you celebrate a baptism that happened a thousand years ago, or your own baptism ten years ago, how beautiful to stop and mark the anniversary, and to give thanks that you were lucky enough to find your way, whether by birth or by marriage or by a long and interesting journey, into the Holy Orthodox Church. I have friends who converted as young families into the faith, all five or six of them baptized or chrismated together on the same day. They don’t look all that different to me from the households that came into the Church a thousand years ago. There they stand, all together, receiving the Holy Faith and entering into communion. Watching them, I feel like they need a Slava. They need to mark this day again next year and every year after it, knowing that they are protected and beloved by Christ’s holy Saints, and giving thanks that God led them home. If you’re a convert, whether you came in alone or with your family, you might consider celebrating a Krsna Slava. You could celebrate a Saint whose feast falls on the anniversary of your entrance into the Church, or you could select a Saint who you already know is praying for you and guiding you. In the Serbian tradition, a lot of families celebrate St. George or St. John the Forerunner or Archangel Michael, but the most common Slava Saint is holy St. Nicholas. In fact, people joke that on December 19, the Old Calendar feast for St. Nicholas, half of Serbia celebrates their Slava, and the other half is invited to a Slava. 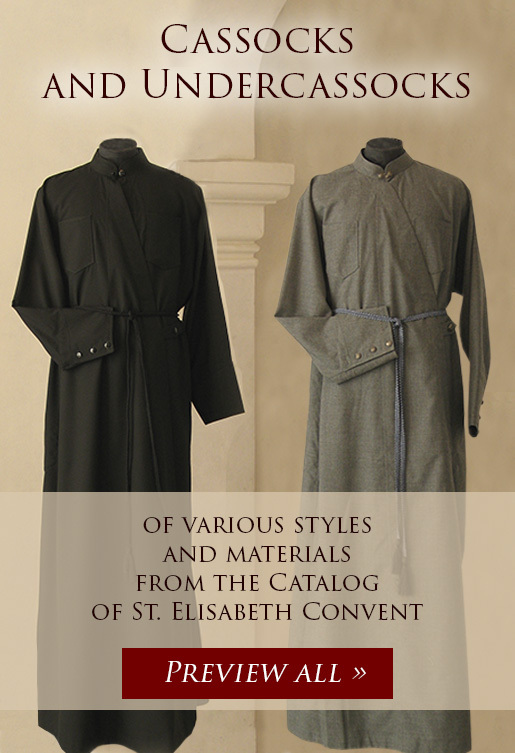 I can imagine that a lot of Americans might choose St. John of Shanghai and San Francisco, or St. Xenia or St. Herman. 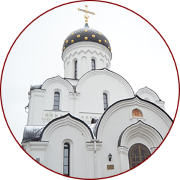 How wonderful if a Slava tradition grew up among American converts, and even the Saints we celebrated spoke to the American experience of Orthodoxy! We wouldn’t call it Krsna Slava, but would translate this as “Holy Feast”, celebrating the feast days of our Little Churches. What a joy if it this Serbian tradition were to be imported and could take root here so much that it might gain an American flavor among American converts. How much would our Little Churches benefit from their own patrons and feast days! There’s a Serbian adage: “Ko Slavu slavi, tome i pomaze” which is something like, He who celebrates the Slava is helped by it! May God help you, and perhaps inspire you to be helped by your own Slava feast as well!